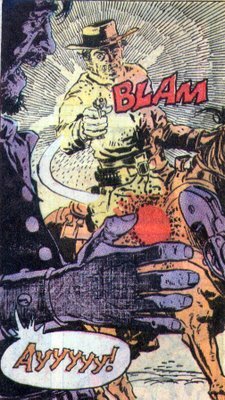 Matching Dragoons: Weird Western Tales #20 "Blood Brothers"
Weird Western Tales #20 "Blood Brothers"
Arnold Drake, Story - Tony DeZuniga, Art. 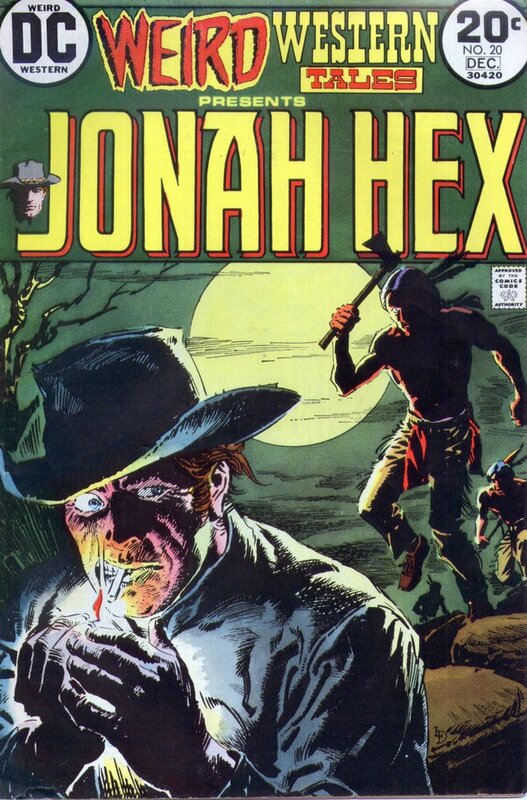 Jonah Hex comes riding into an unnamed town when a man is suddenly thrown out of a saloon & into the street. Another man comes out of the saloon & threatens to shoot the first man. 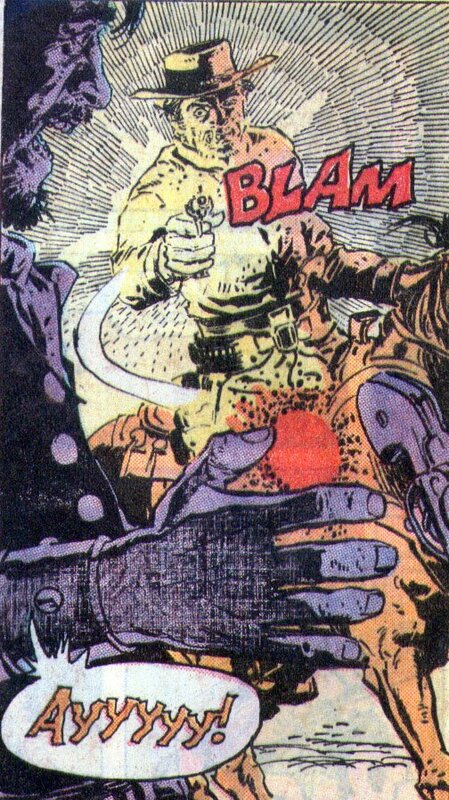 Jonah shoots the pistol out of his hand. The man wonders why Hex doesn't want a 'redskin' shot. Jonah explains that this is an AWOL Cavalry scout with a $50 bounty on his head. Later we learn that Jonah's bounty is John Running Wolf, one of Chief Machana's sons. Since he is the younger son & can't be chief, he decided to join the Army as a scout. Jonah is taking him back to Fort Lang when they come upon an Indian raiding party attacking the fort. One of the Indians fires a flaming arrow at Jonah & he shoots the indian dead. Jonah then turns John in to the Major at the fort. In a sudden unexplained transition, Jonah is riding into town (a different town, I assume) and tries to get a room at Widow Lacey's boarding house. He has an altercation with a man who tells Jonah that he stinks (Jonah smashes the door into the man).Inside Jonah meets the mayor (the man he hit with the door) and Eileen, a old friend. Eileen introduces Jonah to William Vandermeer, who works for the railroad and offers Jonah a job. Eileen's niece, Muriel, was kidnapped by Red Horse. Jonah is offered $100 to return Muriel, $200 if he brings in Red Horse as well. Jonah takes the job, has a brief romantic interlude with Eileen and then goes looking for Muriel. Jonah locates the Indian camp, knocks out the Indian lookout and then spots Muriel. However, he is then ambushed by Red Horse. During the fight, Jonah kicks him unconscious but then is threatened by Muriel pointing a rifle at him. Turns out Muriel loves Red Horse & doesn't want to go back. Jonah grabs the rifle out of her hands and pulls his pistol. Jonah is taking Muriel & Red Horse back to town when Red Horse reveals that he is not responsible for the raids on the Fort. Suddenly, Red Horse is gunned down from above. Jonah shoots and kills two of the three attackers, but Red Horse is dead. Back in town, Jonah dumps the dead indian in the parlor of Eileen's, at the feet of the Mayor, Eileen, & Vandermeer. He also introduces Muriel and tells everyone about the idea that white men hired the Indians to attack the Fort so that the Indians would be run off &the railroad could get their land. Vandermeer reaches for his wallet to pay Jonah, but Jonah instructs Muriel to search Vandermeer's pocket for weapons. At that moment, John Running Wolf tries to sneak up behind Jonah. Jonah turns and pulls a gun on him, but John throws his knife, hitting Jonah in the shoulder, causing him to drop his pistol. The mayor dives for the gun, but Eileen stomps his hand & grabs the pistol. Jonah & John duke it out, but Jonah knocks him outside & beats him unconscious. Jonah takes what is owed him ($200) and then goes to the Fort to report the scheme to the Army. This issue had some nice moments such as Jonah actually shooting a gun from somebody's hand, dumping the body in the parlor, and beating the crap out of a man left-handed. 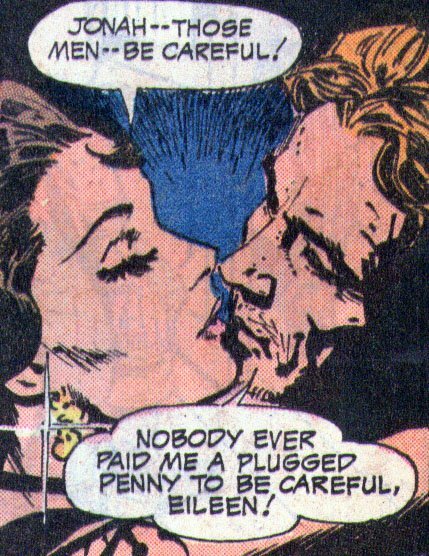 This issue was unusual since it was scripted by Arnold Drake instead of John Albano or Micheal Fleisher, who started with the next issue. It may one of the few original Hex stories not by either of those two men. There was also a backup story called Turnabout with art by Gil Kane & script by E. Nelson Bridwell from a plot by Sergio Argones. Timeline - No reference to anything in a prior issue, so this story could have taken place at any time. Jonah has his gray hat, but nothing else is new or different. Next Issue: A voodoo dance of death and Jonah chokes a fat man.